You are here: Home / Pickleball Fun / Pickleball Rally Scoring — Good Idea… or it Messes with the Integrity of the Game!!!? Nothing generates a retreat to one’s own philosophical corner in pickleball like the ball debate or rally scoring. For both topics, opinions are plentiful – and, like politics, one is not likely to change the mind of another. 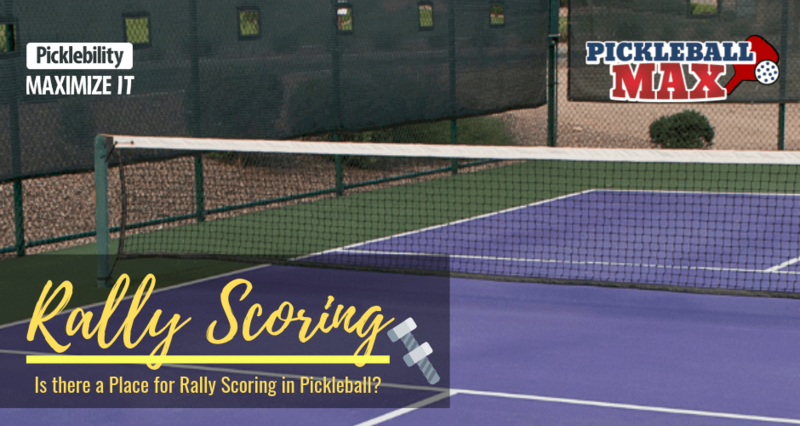 What is Rally Scoring in Pickleball and how does it Compare to Traditional Scoring? In traditional pickleball scoring, the serving team is the only team awarded a point if they win the rally. The non-serving team, by winning the rally, can only force the second player to serve – or force a side-out if both players have served. They are not awarded a point. In rally scoring, a point is awarded to whichever team wins the rally – be it the serving team or the non-serving team. When traditional scoring is used, games are usually played to 11 points. In rally scoring, because a point is always awarded at the end of each rally, games are generally played to a higher score — usually to 15 points. 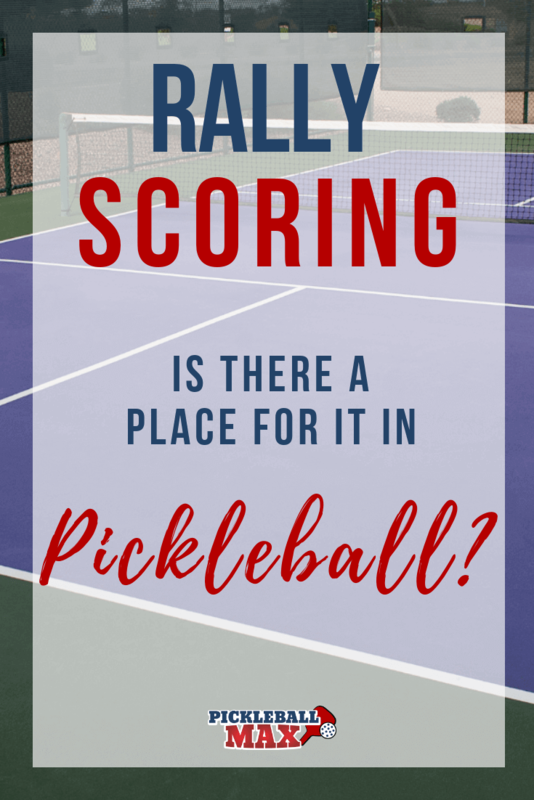 One of the primary benefits of rally scoring in #pickleball is that games end more quickly (approximately 20% quicker), allowing for quicker rotations on crowded courts. This may be particularly beneficial for the local Y or Community Center where people are sidelined and waiting for long periods of time to play. In addition to quicker games, rally scoring also results in much more consistent and predictable game durations. Even in a “shortened” traditional game to 7 points, the game duration could vary significantly — from 5-minutes to 20 minutes – depending on the number and frequency of side-outs. In a rally scoring game to 15 (win by 1 point), the game duration is guaranteed to range from 15 rallies to 29 rallies – resulting in a much more predictable time for the game to be played. So, exactly how is rally scoring played? Glad you asked. Firstly, it’s important to remember that, similar to traditional scoring, the only time one rotates court positions with his/her partner is when you win a point on your serve. At all other times, you do not change court positions with your partner. This represents zero change. In contrast to traditional #pickleball scoring, there is no 2nd server in rally scoring. As such, one only announces 2 numbers (not 3 numbers) when calling the score (serving team’s score first, non-serving team’s score second). The serve will be made from the right side (from the player positioned on the right side) if the serving team’s score is even and from the left side (from the player positioned on the left side) if their score is odd – identical logic to that of singles in pickleball. Rest assured, both players will get a chance to serve during the game — just not immediately after your partner serves. If the serving team wins the rally, they score a point and the partners from the serving team rotate court positions. If the serving team loses the rally, the serve goes to the other side. Remember, there is no second server in rally scoring. The other team will then serve from the right court if their score is even or from the left court if their score is odd (again, similar to how it is done when playing singles in pickleball). Where in the “Official” Pickleball Rulebook is Rally Scoring Referenced? You may be thinking, “Quick, Show me the rule that mentions rally scoring.” Nowhere is rally scoring referenced in the “Official” Pickleball Rulebook. And that’s the crux of the debate. Rally scoring naysayers will insist that the founding fathers meant for pickeball to be played “as-is” and forevermore. Furthermore, they would say that changing the scoring would change strategy, and, consequently, negatively impact the integrity of the game. Personally, I’m not sure either represents an air-tight argument – although I definitely see their point and appreciate their passion. Most sports have evolved over time – to factor in nuances in scoring as well as to speed up the games for practical purposes. Both badminton and volleyball, for example, have evolved over the last couple of decades to incorporate rally scoring. Tennis has noticeably changed as well – and they have done so recently to, ironically, speed up the matches. The All-England Lawn Tennis Club — which hosts Wimbledon — is introducing a final-set tiebreaker beginning in 2019 when the final set is knotted at 12-games. This year the Australian Open matches were decided by a first-to-10-points tie-break at 6-6 in the final set. No longer will we be seeing a 70-68 5th set at Wimbledon. Tennis also has experimented with no-ad scoring and 8 or 9 game pro sets over the years at the amateur level. All changes, I’m certain, required an adjustment in strategy. In my opinion, tennis should be applauded for trying new things. So I’m not sure prohibiting pickleball scoring experimentation – particularly at crowded venues – is entirely healthy. I look forward to hearing your feedback. What say you? While I don’t think we should change it everywhere, I do think various venues could benefit from a modification to the rules. Does rally scoring at least have a seat at the pickleball table in some instances?